UPDATE: I did find a few things on 75% off... but not much. It's finally here! After days of stalking Target, the toys are now 75% off. A friend told a friend who told me that the Star Wars Legos are included at the Perdido Target. I'm assuming that Cordova's Target is also on the ball. So make your list and bring extra cash! I've even seen 75% off women's and girls. Use up those Merona and C9 coupons. Baby blankets and crib bedding were also 75% off at $5 for Circo. Of course that went fast. But pray and check between the shelves. Have fun! NEW Target Printables and Cheap Snacks! UPDATE: I went last Monday to use up the coupons and bought all this for $36.30- not bad since I bought 4 whole chicken too! Goldn' Plump Chicken- only $2.50 plus I found $0.75 peelies on any chicken (they're on the chicken thighs). The best by date was the next day. I'm thinking of writing down the sell by dates in my notebook just in case they do clearance! I cooked one chicken and stored the rest in the freezer. Also, the Market Pantry breakfast sausage was on clearance for $2.24 a bag. They taste great too- perfect for a homemade Mc Sausage sandwich. WOW! Target is cranking out the coupons. Print yours before they're gone. I'm off to Target myself to cash in these deals. Lots of Kashi coupons and kids snack. The healthy should cancel out the junk, right? Well, I'm not above convenience food if that keeps me out of a hot kitchen! I printed every possible coupon found in Money Saving Mom. Add to that GE Reveal $1.50 Target and $1/2 Manufacturer's to get a pack for $0.14 (thanks Totally Target). Also, Kikkoman is $1.42 and use this $1 PRINT or Buy Sauce Get Ponzu FREE. You can combine both to pay $0.42 for 2! Plus submit for a FREE Gift. More details also from Totally Target. Use this to link directly to Target Coupons or go to Target's website and scroll down the bottom. 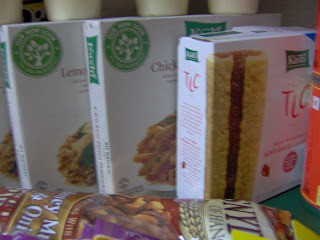 We've been enjoying these Kashi entrees and snacks. I didn't see any peelies for them but watch out for some of the cereals. They have $1/2 Kelloggs or Kashi (maybe Kelloggs bought Kashi?) at CVS and Walgreens. 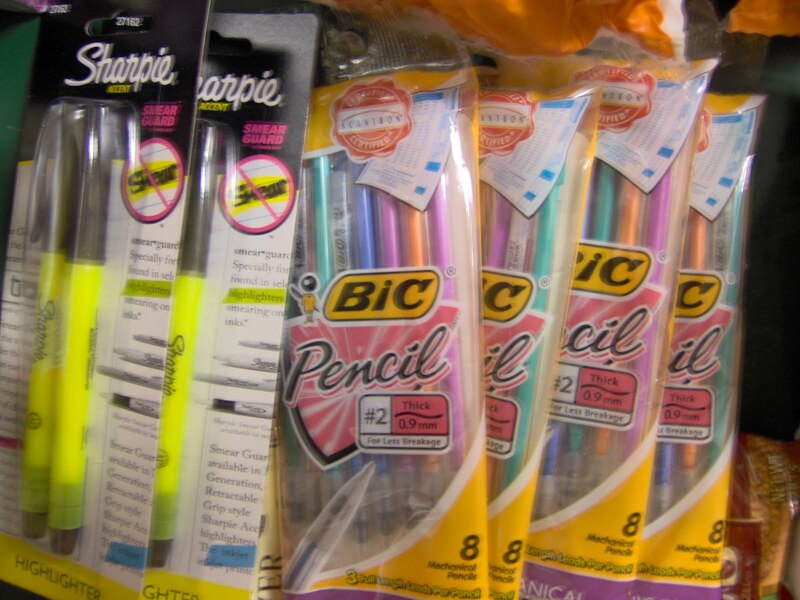 If you already have too many pens, these BIC mech pencils are $1.20 and so only $0.20 for 9 pencils using the $1 Target PRINT. The Sharpie was $0.75 each but with the $1 off 2 Target PRINT, it's only $0.25 each pack! Don't forget you can use these coupons at Publix, too. 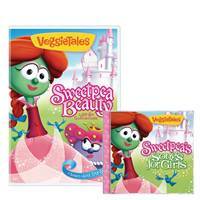 Visit Family Christian Bookstores on Saturday July 31 for the movie release of Veggietales newest story: Sweetpea Beauty. Watch the entire movie at their kids' section at 10am, 12pm, and 2pm. Also enjoy free stickers and coloring pages. The first 40 kids will receive a FREE poster and balloon. They may also serve snacks and drinks. We've attended these for the past few years and they also do prize drawings, including one for the new DVD. Just ask them if they are doing it this time so you can sign-up your kids. We've expanded our kids' DVD library with the free movies they've won. Also, download this Study Guide for Sweetpea Beauty. It's a 6-day devotional that goes along with the story. This post is linked to Frugal Friday where you can learn lots of frugal tips! A warning for firstimers: do not attempt to can blueberries alone. It is a messy job filled with lots of dirty dishes, pots and pans. And do not use white dish towels, even if they are the only ones you have. Because they will get stained. Trust me, I learned the hard way. To my friends who can on a regular basis, I tip my hat to you. Canning is no joke. It's super hard work. 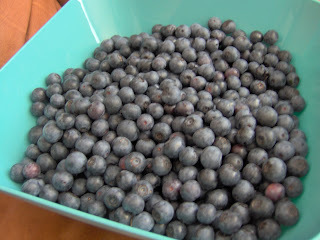 We were blessed with these beautiful blueberries from Beulah Berries. It's hard to go back to store bought. 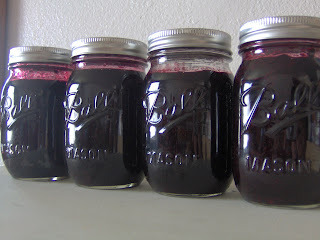 You'll need about 4 cups or 3 pints, box of SureJell Pectin ($2.88 for a 2 pack), clean pint sized canning jars. Wash in hot soapy water if new. Sterilize by boiling in hot water for a few minutes, after they're washed with soap, if reusing old cans. Make sure to dry them with a super clean towel, including the lids. Also get a stockpot with a lid that can fit about 4 jars at a time. Fill it with water so that the top of the jars are covered about 1-2 inches in water. 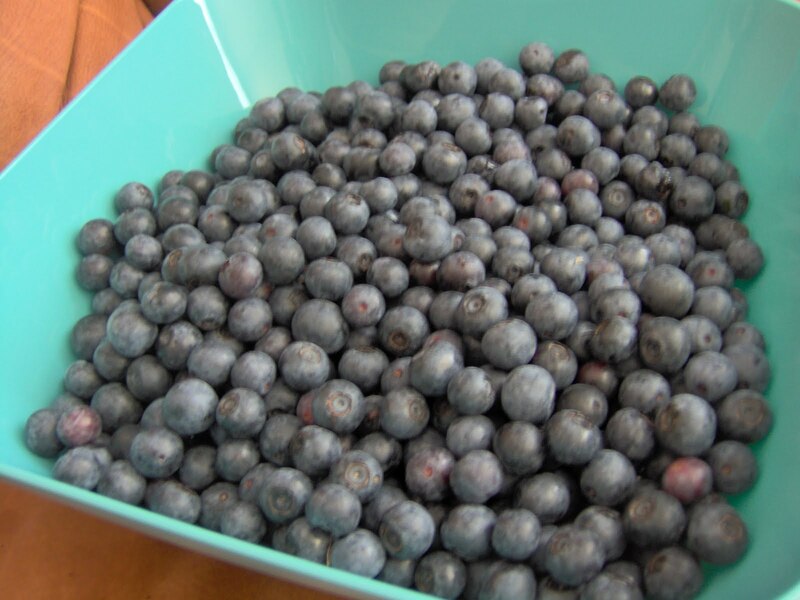 Start heating the water so it's already boiling by the time you finish cooking the blueberries. Measure out 4 cups sugar in a bowl. Set the blueberries in their own bow. Then have a bowl for the blueberries chopped in the food processor. See what I mean about too many dishes? It was helpful to use the food processor. I pulsed a cup of berries at a time, just enough to get a rough chop. 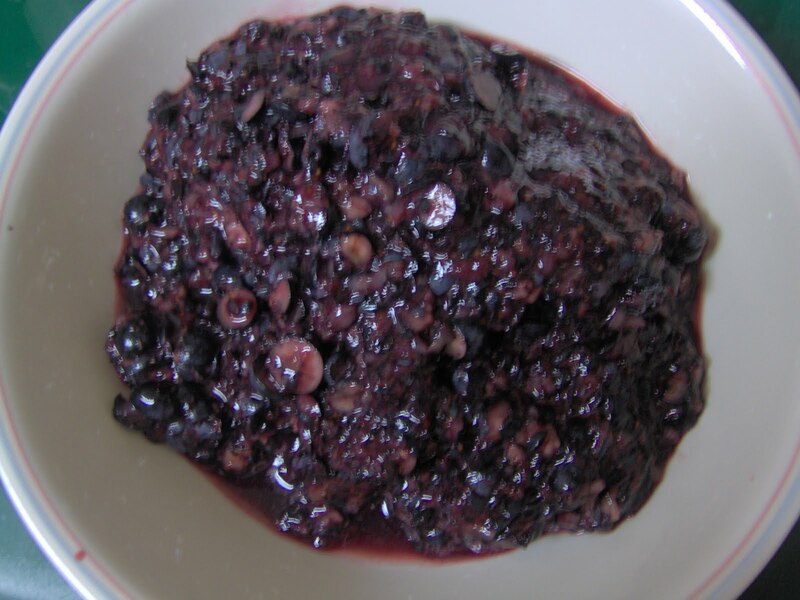 This is what the clumpy mess of berries will look like. Cook them in a 5-6 quart pot on medium high and add the pectin. Add the sugar one cup at a time, stirring the mix to let the sugar dissolve. Let it come to a rolling boil and cook for one minute. Turn off the heat and take the pot off the heat. 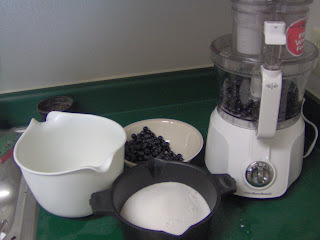 Quickly transfer the cooked blueberries into the pint jars to about an inch from the top. 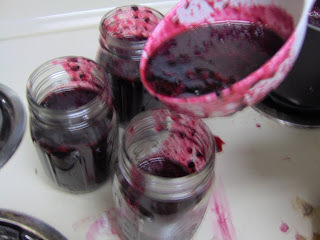 Wipe off the rim of the jar and where ever else it drips. It pays to use a wide mouth funnel (costs less than $2) so you don't have a mess. Tongs would have been great, or a steaming rack, for the next part. The water in the pot should already be boiling. 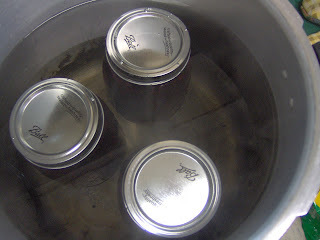 Remove the pot from the heat so the water stops boiling and you can put the jars into the pot. Boil for 10 minutes. After boiling, take them out of the hot water (use oven mitts). At this point, I put the dishtowels in the pot of boiling water. It takes the blueberry stains out easier this way, even without soap. Blueberry jam, so sweet and yummy. 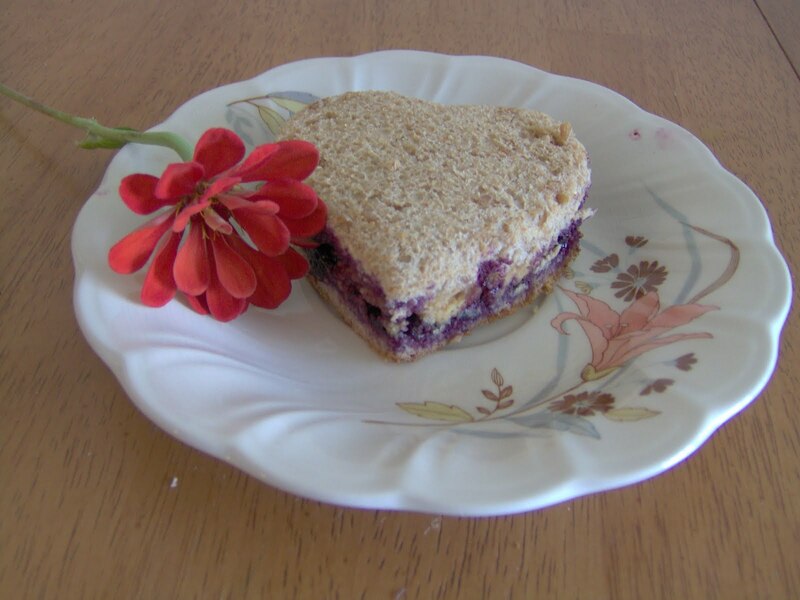 Partner with homemade peanut butter for a nice treat. I'll have to post a recipe for that next time. It's way easier than canning! I visited both Targets in Pensacola this week and was disappointed that they no longer allow overages. They are pricing down the coupons so you get the item for free but the generosity stops there. We could have received $2.50 in overage for C9 shirt since the coupon was $5 off any C9 (no longer available) and there are lots of $2.50 shirts in both men’s and boys’ sections. The store by the mall has lots of cute Merona handbags on clearance. I picked out one that was $2.50 and got it FREE but no $0.50 overage from my $3 coupon. I also picked up that Embark lunch bag for $3.99 and found the Parents Refund postcard inside. The Bic Pens were only $0.60 but went down to $0.10 with the $1/2 BIC Target coupon. For everything pictured, my total came to $5.23. So only $0.27 after the $4.96 Parents rebate. 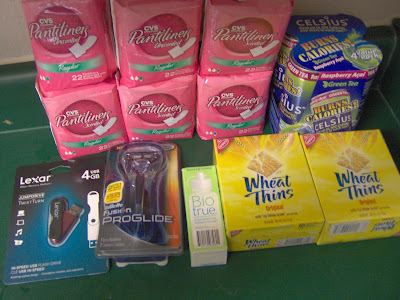 For the items pictured here, it only cost $9.50 for everything! I used the $2.50 Finish coupon for the Orange tabs (they were $2.99 each). I also scored 3 packages of Crystal Light using 3 $2 coupons from Vocal Point. The Pure Fitness version has no aspartame! I’m glad they have all these clothing coupons. I paid $8 for a package of 6 Hanes undershirts for my husband, thanks to the $1 off Hanes coupon. Still no 75% off signs but lots of 50%: Legos, Playmobil, and Trio Barbies, Kai-Kan and Hello Kitty. I have a feeling they’ll be 75% very soon. 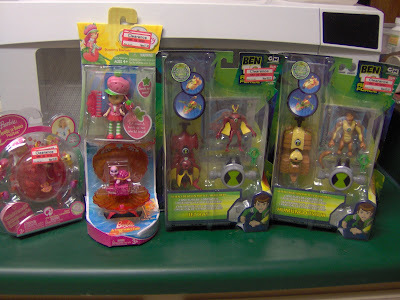 I also saw Leapfrog Tag Junior for $16, are there any coupons for these? A while ago, Right At Home offered FREE products for the first 10,000 to sign-up. I entered as soon as I saw it. 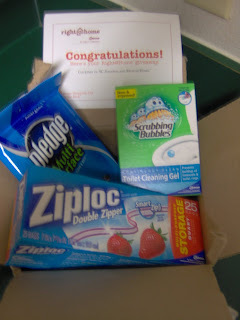 Today a surprise in the mail revealed 3 full size products from them, Yay! I was cleaning out my coupons this afternoon and had to throw away expired Target coupons for Ziploc and Scrubbing Bubbles. It made me so sad. I forgot to use these coupons because I kept waiting on the a freebie deal. I’m glad I didn’t wallow in my coupon negligence for long. I couldn’t believe I got the same items in the mail! Isn’t God such a doting Father? That was totally not a coincidence. Collin at Hip2Save has rounded-up a few sweepstakes for us. Let me know if you win some! Hello all! I'm hanging out at Barnes and Noble today enjoying my kids being at VBS. It's not so easy... not getting interrupted every 5 minutes isn't something I'm used to. We are busy working on a DVD project compiling some youtube videos and about 25 more clips on all sorts of grocery money saving topics. Hopefully, we'll have those available for you in the near future. 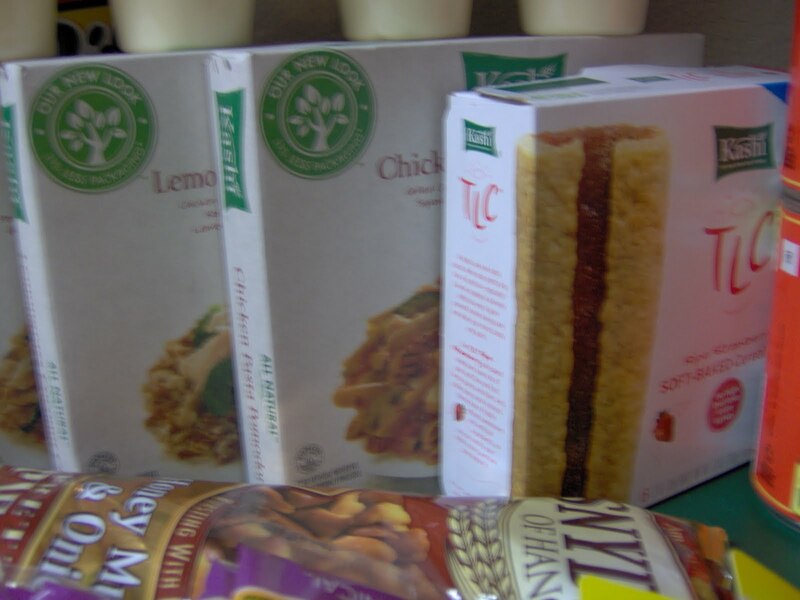 In the meantime, here are some grocery deals I like this week. It's been a while since I've had these up. But at the very least, you can go to the grocery website and blogs that have coupon match-ups. Buy this week's newspaper to get the Food World 25-cent coupons and $5 off $50 Apple Market. You can use both at Publix! Also, I got a $5 off $75 catalina at Winn-Dixie. Rumor is that if you shop at the beginning of the week and buy one of the deals, you should get this to print. Maybe one day, the $10 off $50 will print again. 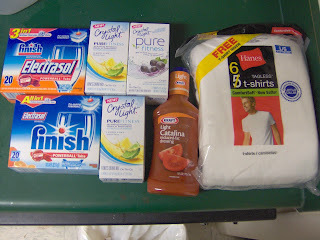 Winn-Dixie grocery ad and match-ups from Southern Savers. Publix grocery ad and match-ups from I Heart Publix. Food World grocery ad and match-ups from Frugal Fairhope (not yet available). At Publix, Smart Balance milk $2.50 (use $2 PRINT = only $0.50!) Hope you printed out all the ones from coupons.com because they're gone! Don't forget the Glade Cling wrap, still $1 and use the $0.75 from Summer Entertaining booklet. I cashed in my blueberry rain check too and got 8 FREE with the $1.50 Publix coupon (it was expiring when I got the raincheck but the grocery manager said they would still honor it when time came to redeem the raincheck). Beware the Blueberry Ocean Spray juice- it's a cocktail, only 15% juice! And the Publix Deli Style Ham is still BOGO $5.79 or something like that. What a great price for 12 oz deli meat and it tastes really good too. $0.88/lb nectarines or green grapes. 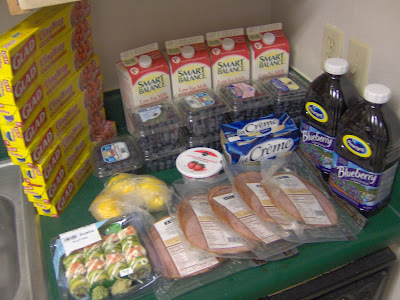 At Food World, spend $30 (should be ok before coupons) pay $0.25 for bacon, bread, eggs and orange juice using in-ad store coupon. I was able to use these coupons no problem at Publix! Give it a try. I was even only purchasing a gift card then and it still worked since these are competitor coupons. CVS sells DVDs (by the registers and photo center at my store). 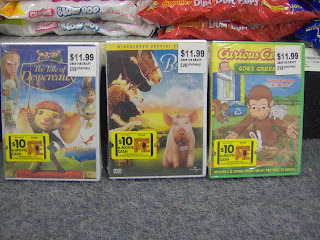 I found a few that had a peelie for $10 Movie e-Cash for the new movie, "Despicable Me". As long as you don't live in California or New York, that should pay for your movie, at least a matinee! Don't forget to use you ECBs to pay towards the DVD purchase ($11.99). This week, CVS has lots of money makers and even milk is going to generate $1 ECB. So, you might get the DVD free with all your overage! There are lots more deals and clearance. Check out Totally Target before you leave the house. That's what I do! Also, don't forget to make room in your closet for the 75% off toy clearance that should happen any day now. I hope you are planning on heading to CVS this week. There are a few good deals to be had! Thanks to Hip2Save for the match-ups! Milk $3.59, Get $1 ECB (limit 2) Thanks Carolyn! Similac formulas, pacifiers and more are 75% off too. Other stores may even have items for 90% off. Check your store! I bought a bag of soil for $1 last week. July 4th decor are also 50% off. Onto other Publix news, IHeartPublix has the Sneak Peek ad already. Stay tuned Tuesday for the Super Deals. Heads up on Smart Balance Milk, they'll be $2.50 starting Weds. Use the $2 PRINT from coupons.com and pay only $0.50 each! We've been enjoying these for a couple of weeks and I think they taste great. My 5-year old is suspicious though. He asked me, "Mom, is this cow's milk?" His eyes bugged out at my reply: "We only drink cow's milk." Quite a head-scratcher for a little guy. Beulah Berries $5 per Gallon! It's almost the end of blueberry season here in Pensacola. If you have any picking power left in you, head over Beulah Berries soon. Pick 3 gallons or more and it's only $5 a gallon! I suggest going first thing in the morning, like 6am and bring exact change. There is an honor system for paying when the owners are not there. All you do is put your cash or check in the envelopes provided and drop it in the blue self-payment box. If you pick less than 3 gallons, it's still $10 a gallon. I would go just to experience it, if you haven't been, and drink the famous blueberry tea. This post I wrote has directions and a video about Beulah Berries. I made jam, 14 pints in all with 2.5 gallons. The berries are super ripe and just right for jammin'. Big Daddy Weave- FREE Concert Friday! If you are local to Pensacola, head to NAS tomorrow for a FREE Concert. 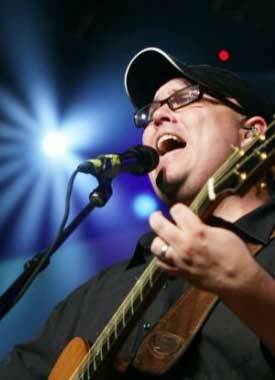 The "Stir It Up Concert" will feature Big Daddy Weave, FFH, and Meridith Andrews. Venue will be in NAS Pensacola on the Portside Lawn at 5:30pm. Gates will open by 4:30pm. Bring lawn chairs and maybe a fan spritzer because it will be HOT outside. But worth it for a free concert, right? Image and info found on North Escambia.com No tickets required, just show up for a great time! Go down Radford Blvd (away from South Gate). Slight right onto South Ave. Turn left on East Ave.
Saufley St is the 2nd street on the left. Don't you just love all these deals. Not only for your family, but perfect teacher's gifts... maybe even for your Sunday School teacher! Thanks Money Saving Mom for heads up. $10 off $20 PRINT (pdf) Thanks Hip2Save! Penny Items and Dollar Deals... I wish we had Staples. Their store was almost ready to open but they backed out last minute. Now, the building stands as a reminder of what could have been. So if you have one in your area or you're on vacation and near one, take advantage of the savings for us Pensacolians! Don’t you love the back-to-school sales? Even before my kids started preschool, I looked forward to buying the $0.25 crayons at Wal-Mart. 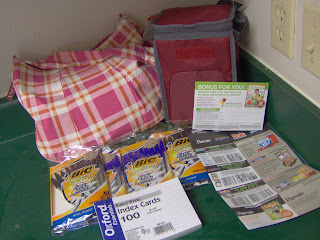 But last year, I gpt FREE school supplies at CVS with their ECB deals. Now I don’t even bother with Wal-Mart’s deals. If you only need a one or two deals at a time, or need to roll over those ECBs, watch and wait for the CVS deals. Compare how much you’d pay for tax in the end though. For example, if it’s $0.20 tax after that FREE notebook, then maybe $0.10 at Wal-Mart’s is cheaper. *ECB given only Sun., Mon. and Tues.
=FREE + a $2 moneymaker! =$0.45 for a great on the go snack! *My store starts the new week's deals on Saturdays. But at the same time, you can still take advantage of the current week's deals too. So I like to shop then because I can do two weeks of deals in one day. If they're out of a product, then I just get a raincheck. Use That $5 off $50 Apple Market Q at Publix! ***Bookmark I Heart Publix's Ongoing Deals. Combine these with the Super Deals to get the most savings every week. Have you been buying the Weds newspaper? Not only can you find the grocery ads there but don't forget to clip the $5 off $50 Apple Market coupon. It's usually found in the food section. Publix now accepts this as a competitor coupon for the Pensacola area. Keep in mind that it's a $50 purchase before other coupons. So, don't let your reaction be, "I don't need it because I don't plan to spend $50 at Publix." Rather, start thinking, "What items could I get to bring me up to $50 but have high value coupons to bring that total way down?" Use any coupons for FREE items or that give overage. If you shop every week based on your weekly menu plan, my list might be preposterous to you. That's because this is more of a small scale stockpiling trip. I'm gathering enough $0.25 peanut butter and $0.66 apple juice to last us for at least 6 weeks. Simply changing the way you think about your weekly shopping trip can dramatically lower your grocery bill. It's just like buying winter clothes in the summer when they are on deep clearance. Stockpiling at it's best means combining coupons with great sales for the cheapest price. *There is a bacon tearpard $2 off Hormel bacon wyb Nature's Own bread. So since I'm getting two breads, I should be able to use two of these coupons. But do I get two bacon items? Probably. I'm saving myself trouble and let one of the managers figure it out for me. Wow! That still amazes me how you can start with a $50 purchase (still great with all the BOGO sales). But only pay $6 after a stack of coupons. It's not impossible, it's Publix! I have not been inside a commissary for years. And I don't remember it ever being quite so insane. The checkout line wrapped around half of the store perimeter. I kid you not. It was Thursday after lunch. So, there's no reason for the madness. Almost everyone had carts filled to the brim like a hurricane is going to hit tomorrow. It didn't help that the aisles were as tight as the parking lot. We could hardly maneuver the cart without knocking shelves and shoppers down. At one point, my friend parked the cart at one end of the aisle and we just walked to down to get our items because it was that crowded. Coupons plastered on products made me want to buy everything. Not to mention all the great sale prices. The variety itself is amazing. I could never find Sue Bee honey. Now I know every single one is at the Commissary. Did you know Cascadian Farms makes jams and jellies. It's only $1.86 there, so $0.86 with the $1 coupon that comes out often. They also have Earth Grains bread from $1.99-$2.41 with a tearpad coupon for $1 off produce when you buy bread. During checkout, we realized that as long as you bought some produce, be it a bunch of $1 turnip greens, the coupon will work. So we didn't need to have the same number of different produce for the number of bread. There was even an announcement over the intercom about a deal on Kraft cheese: "Buy 6 get $3 off. Only $0.75 each with the coupon. Aisle 13, limited number of coupons." I turned to my friend with my eyes bugging out. Go ahead, she says. First I was on a mission to find Aisle 13. I saw the cheese ahead and asked every shopper around, "Where is the coupon they announced on the intercom?" They stared at me with blank looks, "What are you talking about. We just ignore those announcements." So I walked around and around looking at everyone's hands for the coupon. This little old lady I interrogated had one and she pointed to the endcap where it was. A lady stood there in nondescript clothes with two coupons left stashed in her back pocket. It was her I needed to find and not a tearpad. Wow, they must crack up seeing people get all bent and twisted up looking for coupons. When we paid, to avoid the line that wrapped around half the store, we did self-check. That was a circus show all by itself. In the end, I paid $11 for 5 loaves of bread, 6 packages of cheese, and mustard greens. Not bad. Even with their low prices, I still saved 42% with the coupons. But, for now, I'll stick with Publix and Target where more elbow room makes for saner shoppers. Every extreme couponing convert soon stops paying Wal-Mart a visit. There are too many deals to be had elsewhere. But when it comes to produce and meats price-matching, Wal-Mart is still the one-shop wonder. My shopping trip came out to $30.50 which is more than I spend at Publix on one trip. 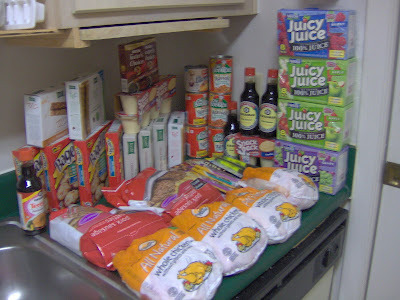 I do miss eating real food and it's hard to find coupons for fresh fruits and veggies. Also, look for Woolite in the endcap. It's in a plastic bag package instead of a bottle. Only $5 for 30 loads and they have a $3 coupon peelie. So only $2 for great detergent! UPDATE: Clearance is now 75% for Black Dot. Thanks Jen! Okay, so I had fun with this shopping trip. I'm very thankful my kids were super duper nice and deserved all the free popcorn they got later. Plus I finally got that elusive Vanish Drops. I used two B1G1 manufacturer coupons. It's supposed to stack with the Target B1G1 but the cashier gave those back to me, saying that she didn't need those. From the receipt, it looks like the coupon made each item free instead of B1G1. So I wonder if the Target coupon would do the same. Anyway, I spent $1.53 on brownies and tuna and splurged $10.20 on Dollar Spot including $1.25 on a black straw hat! Thanks to my friend Misty for the heads up since I love me some Target Dollar Spot clearance! It's 50% off since Tuesday, so it will likely go down to 75% very soon. Even the Rayovac batteries are only $0.50 and FREE with overage using this $1 PRINT. If you buy 2 packs of batteries and used two $1 coupons, you'll get these and two other items FREE because of the overage! I didn't even think about it until I saw the picture and receipt at Hip2Save. Some have reported problems using this coupon for the batteries in the red package because it says Heavy Duty. But logically, these should also be alkaline because what else is there if it's not lithium or rechargeable? Since Target has these dollar items on clearance, I've only been to the Dollar Tree once or twice a year. Why pay $1 when you can pay $0.25 on 75% clearance? If you are a homeschool or classroom teacher, they have lots of teaching supplies like name tags, weather charts, lesson planners, perpetual calendars, award certificates and more. This timer is $2.50 and shaped like an apple. How cute is that! I also found Betty Crocker Dark Chocolate Brownie Mix for $0.69 and the Supreme Brownie Mix for $1.89 (cheaper with $0.75 off 2 PRINT). Starkist tuna pouch for as little as $0.84 were by the endcap instead of with the other tuna. If you subscribe to All You, use the B2G1 from July and $1/2 from May to pay $0.64 for all 3. Check other Cheap Finds from Totally Target for more deals! In my case, the cashier would only give me $0.84 instead of $1/2 and I decided to let it go. For some reason that is how the coupon rang up. Plus lots of chair pads and cover-ups too! 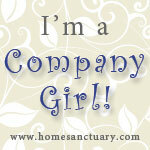 50% off select comforters, table cloths, curtains. =Only $1 each after Gift Card! I Have Not Fallen Off the Earth! I can't believe it's been a month since I've been on here. Everyday, I aim to blog but the summer sun has gotten the better of me. Well, it's really been the family. We've enjoyed lots of family time, 2 VBS weeks, summer camps and date nights after finally finishing First Grade and Preschool homeschooling! Yay! I plan to be back on a fairly regular basis this weekend. See you then.